Our mantra in “Sleepwalking Toward a Precipice”, now at Amazon here, was (and is): (i) decades-long structural problems were revealed by crisis, (ii) politicians implementing short-term “solutions” exacerbate these structural issues, (iii) in their place, unelected central bankers have become central planners, distorting markets and eliminating failure, (iv) a number of “unknowns” should be monitored, (v) corporate earnings are highly correlated with GDP growth, (vi) historically, new bull markets start with a single digit market P/E so we may see “P/E compression” in coming years, and finally, (v) investing should be in nimble, tactical “rent don’t buy” strategies that provide for participation in central bank reflation but also provide downside protection. Now, let’s take a look at how 2012-2013 is treating some of our themes from Sleepwalking (because as the ‘70s rock band Lynyrd Skynyrd sang, “there are things goin’ on that you don’t know”). Stairway to Heaven: In 2011, the S&P 500 experienced big moves up and down ending “unch” at 1258 (“Home, Home on the Range to Unchanged”). In 2012 and early 2013, the S&P 500 methodically marched up the “Stairway to Heaven”, with real potential to challenge the all-time high of 1576 from October 2007. The strong up moves followed last minute agreements by U.S. and European politicians and extraordinary actions by the Federal Reserve and European Central Bank (ECB). It appears markets increasingly believe that those in power will do “whatever it takes” to keep countries, banks and economies out of crisis (whether it be political deals or unlimited central bank money). Accordingly, the S&P Volatility Index, or VIX, (a measure of “fear” in the market) reached a near 6-year low of 12.08 on February 19th, signaling an extreme level of complacency. Fiscal Twits: In 2012, our best and brightest “fiscal twits” were at again, failing to address the toxic mix of automatic spending cuts (sequestration), tax expirations (Bush, payroll), farmer and race car track subsidies and breaks, among many others (all in all, the “fiscal cliff”), until January 1st (the last non-market day they had to get something done). And for all the sturm and drang they settled on a mini-deal of extensions of numerous subsidies and breaks, and the Taxpayer Relief Act raising taxes on the “wealthy” (or, “asking some folks to pay just a little bit more”), and kicking the sequester cuts to March 1st. Meanwhile, our president averaged a fundraiser every 60 hours, Republicans tripped over themselves to make 47% of the gaffes allotted to them by Grover Norquist, some congress people actually considered the idea of a Treasury minted Trillion Dollar platinum coin to avoid the debt ceiling, while sequestration cuts (March 1st), immigration reform, gun control, raising the minimum wage (sounds great but bad), closing tax loopholes (good) without lowering rates (bad), and a myriad list of new government programs from the State of the Union address dominate debates. Meanwhile the entitlement leviathan (very bad) that threatens the Federal budget long term more than any defense program or other discretionary spend is simply ignored like so many lamps, hanging pictures and stairs as Trillion Dollar Sam continues sleepwalking. And, real pro-growth policy in this most divided Washington continues to be a dream. In a Nutshell: As we delineated in Sleepwalking Toward a Precipice, our nation’s debt and deficit issues come down to hard choices. The national debt has grown from $15 trillion in November of 2011 to $16 trillion in September 2012, to $16.5 trillion as of this writing. The $1 trillion in tax breaks that could cover the $1 trillion entitlement budget shortfall are still allowed, and the nation runs $1 trillion annual budgets as a result (going on 5 years). It is amazing that the math illustrates that the uncertainty and nervousness that pervades CEO corner offices and middle class corner bedrooms over debt and the nation’s future could be solved if constituents told their congress people they are ready to take their medicine. Instead Trillion Dollar Sam gets some botox, appears at the Academy Awards, and nobody is the wiser. Fourth Branch Fail Safe: With all the brinksmanship, fear mongering, and lack of shared sacrifice, structural problems remain, and the Federal Reserve has further cemented its role as the fail safe central planner for the U.S. markets and economy (growing its balance sheet to over $3 trillion through extraordinary crisis and post-crisis actions via its “Capital Misallocation & Market Distortion Device”). The Federal Reserve instituted QE3 and QE4 in August and December of 2012 (together QE-unlimited) injecting $85B per month in liquidity into the system (or $1T annually) until and after U.S. unemployment reaches 6.5% (down from 7.9% currently). Along with the ECB’s unlimited support of troubled Euro Zone countries (below), that liquidity has markets moving upward in “don’t fight the Fed” mode. Market reliance on QE-reflation shone in the release of the Fed minutes February 20th as the S&P 500 fell 1.2% on news some central bankers are less than keen on unlimited QE (ending a 45-day run without a 1% down day, the longest streak since November 2006). Virtuous Cycle: Three years into recovery, first blush fourth quarter real GDP came in at -0.1% annualized. Economists explained that the 4Q decline was due to government spending cuts and pointed to a rise in consumer spending, real income and business investment as positives during the quarter. If government spending continues to be a drag, business and consumers must pick up the slack (business investment, hiring, rising wages and spending in a virtuous cycle). The most recent Bloomberg Business Roundtable survey of CEOs listed top concerns as “uncertainty over America’s fiscal situation, the seemingly never-ending European banking crisis, and global policy response of currency devaluations to weak economic growth.” The survey revealed CEO expectations for capital expenditures, investing, and hiring are back down to 2009 levels – not good for the virtuous cycle. Overall, in three years following recession, U.S real GDP growth is trending around 2% (2.4% for 2010, 1.8% for 2011, and 2.2% for 2012). …or does it, the 17-member Euro Zone is officially back in recession, contracting 0.5% in 2012. And, now, recession has spread from the periphery to the core of Germany and France. The 27-nation European Union posted a 0.3% contraction as well. Euro Zone unemployment climbed to a record high of 11.7% in 2012, and EU unemployment climbed to 10.7%, compared with 10.7% and 10.0% respectively in 2011. Economic contraction and still rising unemployment promise more social unrest, political turnover, and continued “Sleepwalking” for the failed Euro Zone experiment in 2013. The transmission of Euro Zone stress outside of its borders is obviously being felt hardest in the rest of Europe, but China is also feeling the pain as its largest trading partner. An 800 Pound Panda named “Status Quo”: Speaking of China, the “Middling Kingdom of Debt” recorded real 2012 GDP growth of 7.8%, the lowest in 13 years, and down from 9.2% in 2011 and 10.4% in 2010. Annualized growth slowed demonstrably in the first three quarters of the year (8.1%, 7.6% and 7.4%) largely due to flagging exports to the West and government credit tightening efforts to curb inflation and real estate speculation in late 2011, which in turn grew out of the massive $580 billion government stimulus and $2.7 trillion in government authorized bank loans to fight flagging exports to the West during credit crisis in 2008 (round and round we go). Growth picked up to 7.9% as China exited 2012, allowing a smooth once in a decade leadership change to take place in November, and the rolling of nearly $500 billion in local government debt due to mature by the end of 2012 to prevent default. China’s wildly imbalanced growth model and debt building continues – feeding “Status Quo”.So, what did the central government do to get the Panda moving again? The central government authorized more fixed investment projects to the tune of $160 billion, and local governments reportedly added on another $2 trillion in spending. Wait, I thought China is supposed to be rebalancing towards more consumption, and less wasteful investment and debt? Nah, they dare you to knock that Eveready of debt-fueled infrastructure spend off their shoulder. Solid Branches: The root cause of so many global problems is debt that spreads out into other issues like so many solid oak branches stifling growth. Refusing to allow clearing of the system of bad debt, and indeed adding massive amount of deficit spending on top of it has made dealing with long term structural problems and instituting pro-growth policies virtually impossible. Four years after exiting the Great Recession, over half of world economies are currently in contraction again, including the U.S., the Euro Zone, the larger European Union, and Japan. Pro growth policy is sorely needed, but it appears as of now that central banks will remain central planners for the foreseeable future. And, growth in the U.S. seems capped around 2%. Rent Don’t Buy: In Sleepwalking, we discussed how government intervention has helped maintain 2% growth, but structural issues, central bank distortions, and a variety of other “unknowns” make the future prospects for growth doubly uncertain. We also discussed how over the long term nominal GDP growth is highly correlated with earnings. The U.S. markets are in a long-term, or secular, bear market and historically P/E compression in to the single digits has occurred prior to starting a new bull market (currently at 17x). In this uncertain environment, we recommend “renting reflation” through tactical momentum, trend, and mean reversion strategies allowing for riding central bank money printing, and waves of sentiment, while providing for downside protection via risk triggers. We run strategies in house in each of these areas, JBL-Momentum, JBL-Trend, and JBL-Event. These strategies are designed to take advantage of what the markets are telling us and adjust accordingly. For example, right now our Momentum portfolios are long U.S. mid and small cap equities (value, blend, and growth), financial services, and health services, Trend portfolios are 80% invested to a variety of sectors, and JBL – Event has about 35% exposure in one month statistically high probability plays. All that may change in March. The key is to be involved, but be nimble, and mechanically move to Treasuries or cash during times of stress. Conclusion: Lynyrd Skynrd also recorded a song entitled “Am I Losing?” – a song about the long struggle of years of incessant touring, stress and loss. It has similarly been a long hard march since 2008 for most investors. We at Cravens Brothers believe we are serving clients well through our internally managed strategies to increase clients’ probability of success – their winning percentage. In addition to our JBL strategies, we attempt to reduce cost basis for clients’ legacy positions using a variety of strategies. On the wealth management side, Cravens Brothers provides (or partners to provide) a range of other small family-office services to including family and business succession, governance, estate, regulatory, and tax guidance. If you would like to discuss our strategies and services offering, please do not hesitate to contact us. 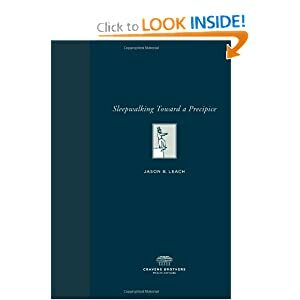 Please pick up a copy of Sleepwalking Toward a Precipice at Amazon here. Or, contact us and we would be happy to send you a copy. So, we spent a bit of time last year putting out the three part series “Sleepwalking Toward a Precipice”. The purpose was to boil down many issues we see impacting growth and market returns into short reads with fun illustrations so anyone could spend a short amount of time getting up to speed on a raft of different issues and decide how they might want to position their portfolios going forward (we suggested some “tactical” methods). We decided to put the pieces together in a paperback, now on Amazon. It makes for an interesting and funny one hour read, a nice coffee table book, conversation piece, reference, and/or gift (to someone who needs a “mean diversion”). Proceeds go to Amazon not Cravens Brothers (i.e., we make no money off it). “Sleepwalking Toward a Precipice”: Our Observations and Outlook, Part 3 rounds out our Sleepwalking series for 2012. This year’s multi-part discussion looks beyond debt and deleveraging (see 2011’s “The Age of Deleveraging”: Our Observations and Outlook), to assess the myriad influencers of growth, and thus market prospects going forward. Part I of Sleepwalking Toward a Precipice focused on structural issues in the United States. In Part II, we discussed structural problems in Europe and China, a variety of unknowns that could impact growth and markets going forward, and central bank rule. In the final installment of the Sleepwalking series, we discuss secular bears, P/E compression, “accordion-shaped” markets, “renting reflation” and “essential essentials” as we lay out some of our recommendations. We hope you enjoy and please email or call with any questions. Click now to download SleepwalkingPartIII to view full-screen as a PDF. Recently, I found myself on a plane making an emergency landing, again. I have flown to and from a certain city four times in my life and had emergency landings on two of four occasions (2001 and 2012). I detailed my 2001 adventure in last year’s “Everybody Stay Calm!” The ritual: (i) get on for the ride, (ii) volatile mishap on the way up, (iii) rapid descent, (iv) get out quickly (via fun slide or boring jetway), and (v) wait for indications of what to do next. The violent “accordion-shaped” up and down moves in the commodities and equities markets the first halves of the last three years have left investors similarly “normalized” to the abnormal. This year, the Dow posted the best 1Q performance since 1998 (+8%), followed by the worst May since 1940 (-8%), followed by the best June since 1997, (+4%) – the gain for the first half of the year. Get on for the ride, volatile mishap, rapid descent, and slightly propitious exit. This year’s odyssey revealed a lack of leadership more awe-inspiring than my first dance with death eleven years ago. Instead of one leader “losing it” (i.e., the pilot), the entire leadership “lost it” (the airline), herding 150 or so passengers around the airport for 5 hours with no explanation, handing out useless taxi vouchers, delaying the replacement flight the next morning for another 5 hours with no explanation, and finally another 2 hours “due to an equipment malfunction” on the plane we hadn’t even boarded yet. Upon hearing this first direct communication from our “leaders” in over 24 hours, two would be passengers flipped out and had to be “escorted” to the “can” by security, ostensibly to be given some literature on how to behave when “Groundhog Day” meets “The Twilight Zone” and one must live through their progeny. Similarly, in our global airport, not just one leader or leaders has “lost it” but an entire world of leaders is failing, repeatedly. The “Six Month Window”, discussed in Sleepwalking Toward a Precipice: Part I, where meaningful action in Washington happens in a brief time just once or twice every presidential term is proving more powerful than ever. U.S. leaders ignored their constituents (like so many passengers) in not addressing Bush and payroll tax cuts until the wee hours of 2010, and gridlocking over the debt ceiling and rejecting and ignoring the bi-partisan Simpson-Bowles and Domenici-Rivlin deficit reduction plans in 2011 and 2012 to the point of government shut down and sovereign downgrade. Ending 2012, politicians are ignoring the potential fiscal cliff -4% drag on GDP (~$567B), set to take effect in 2013, which would send the 2% U.S. economy into recession. Why? Elections of course, with politicking around “which rich” should be taxed higher (Democrats) and a ceremonial Affordable Care Act repeal vote in the House of Representatives (Republicans). It’s beyond absurd. After 17 (count ’em) European summits on the debt crisis, Euro Zone leaders are playing dangerous games of political chess through the media and in person (Mario Monti of Italy threatening a potential end to the Euro Zone if bailouts and growth measures aren’t enhanced and Angela Merkel of Germany not “seeing” mutually guaranteed Eurobonds “in her lifetime”). The the new “Latin League” of Spain, France, and Italy recently aligned to outflank German leadership at the June 28-29 summit (or did they? German King to e…exit? ), but new aggression by Latin leaders is not in their constituents’ best interests any more than Germany’s hardline stance is for its constituents. If it were, they would write down sovereign debt across the “Whack-a Mole” countries, let the banks fail and, let the bondholders and equity holders take the hit, move good assets to good banks, bad assets to bad banks, and not leave the taxpayer on the hook for decades. The pain would be very harsh for a time, and politicians would be blamed and ousted, but letting the system clear, taking the strategic (i.e., long-term) view instead of the tactical would benefit country and citizen immensely (see: Iceland, Sweden, Argentina, Russia, Thailand, Korea, etc.). As Luxembourg’s Finance Minister put it in December, “We all know what to do, but we don’t know how to get reelected once we have done it.” At least he is honest. European leaders are as self-interested as American ones. The Chinese Premier is talking up more fixed investment and the PBOC is cutting reserve requirements so banks can lend more into an economy desperately not in need of still more wasteful spending (and they say the West has a debt problem). China is in a “China-cession”, with official 2Q12 GDP growth down six quarters in a row to 7.6% with electricity usage and manufacturing output data indicating China may actually be in outright contraction, while also dealing with public furor over the excesses and corruption of monied political elites and the myriad structural problems of a misaligned state-capitalist growth model. So, what to do? Build more stuff. Bob would be proud. Jack Welch wouldn’t. The point of all this is, we have been here before, 11 years ago for me, and last year, the year before that, and the year before that for politics, the global economy and markets, but, the leaderless world is worsening in trend and magnitude: (i) leadership is failing on a grander level (years of brinksmanship and gridlock is wearing down the gears of cooperation to the point of complete divide and rising social unrest and fringe parties), (ii) conditions are deteriorating faster and further with every “delay and pray” (bailout agreements and “new plans” have shorter and shorter positive half-lives), (iii) incredible uncertainty and mental fatigue is becoming the norm for businesses (delaying spending and hiring for years), consumers (stalling job growth, wages, consumption), and investors (years of net flows out of equities and into bonds for safety), and (iv) real breaking points are coming closer in economies and markets (Euro Zone-wide recession/depression, “China-cession”, and U.S. indicators pointing to recession currently or in the near future). Apparently our “leaders” have no “literature” on how all this is actually bad. In terms of markets, after the June 28th-29th Euro Zone summit agreement on a memorandum of understanding of a plan for a wish for a hope for a pixie dust of a solution, commodities and stocks rallied strongly for almost 5 full workdays, then it was over. Investors realized the summit was somewhat of a “breakthrough” in coordination, but sobered up to the realization that: (i) bailout funds (~$650B, less $120B earmarked for Spanish banks) will have to be significantly enhanced to directly recapitalize additional Euro Zone banks and potentially directly purchase sovereign debt of distressed countries to keep country borrowing rates reasonable (the latter of which Germany opposes), (ii) establishment of a Euro Zone banking regulator overseeing bailout recapitalization will probably not be in place until mid-2013, (iii) the German Constitutional Court has yet to rule on whether Germany could legally even fund its portion of the ~$650B ESM much less use it for the new proposed direct bank recapitalizations (the latest is that it will be 2-3 months until a decision) or sovereign bond purchases, (iv) ultimate progress towards a banking union will require relinquishing sovereignty which will be difficult to say the least for 17 proud countries, (v) debt mutualization (shared taxpayer burden of “Euro Bonds”) has not been agreed upon, and (vi) ultimately the European Central Bank (ECB) still remains the “Single Word Score” to intervene in markets to keep sovereign borrowing rates down until the 18th through however many more summits it takes to come to an ultimate resolution to the Euro Zone experiment. Note: I am sure someone somewhere is tallying the number of 1920s-1930s European debt summits versus today. Those didn’t end well, although a debt jubilee (i.e., mutual forgiveness wiping slates clean) was almost at hand in the early 1930s (if not for extra French demands on Germany which aided in the rise of the, until then, fringe Nazi party to control of the German parliament). A jubilee would be impossible in today’s quadrillion (thousand trillion) dollar derivative-riddled markets (but I digress?). As political leadership on debt and growth-related policy repeatedly fails to take root, central control has been ceded to the collective “Fourth Branches of Government” (i.e., central banks) around the world to reflate economies and markets. As such, it has become familiar to view reverse pyschology repeatedly gripping and ripping stocks and commodities onward and upward on very bad economic data (if not just putting in a short-scaring bid under them as in April and June). That is, “what’s bad is good” for risk assets (minus the wise, grounded bond market) as prospects for central bank intervention increase with bad economic and market data including: (i) weekly jobless claims remaining stubbornly near 400,000, (ii) lackluster employment gains averaging just 75,000 in 2Q12 vs. 226,000 in 1Q12, with more people added to disability roles than the ranks of the hired since 2008 (3.1MM vs. 2.6MM), (iii) U.S. and global manufacturing data slumping, with 80% of global purchasing manager indices in contraction, (iv) Chinese GDP slowing for the 6th consecutive quarter to 7.6% (the lowest since the credit crisis), or (v) the stock market falling below where the Fed thinks it should be as Bernanke believes the Fed has the mandate to create a “wealth effect” by artificially boosting stock prices. Indeed, central bank intervention has been the lifeblood of the post-2008 stock market “recovery.” Therefore, the hope or reality of U.S. QE3, PBOC reserve requirement cuts, British QE expansion, and the ECB easing its historic inflation fighting “cut off nose to spite face” stance via bond purchases, 2 LTROs, and now multiple target rate cuts are pushing stock and commodity birds higher while economies founder. The wise grounded bond “plane” is telling you something though, and what it is saying is everything is not clear for take off. Market pundits will say there is a bubble in Treasuries, and U.S. equities are the buy of the century because the U.S. consumer is delevering substantially, American companies’ balance sheets are the strongest they have ever been, and U.S. equities are trading at just 13x next year’s earnings when the long-term average is 15x-16x. Then they will be the first to turn around and tell you something else at the first signs of systemic problems. The reality is U.S. consumers and businesses have been scared into better balance sheets, and it doesn’t mean they are willing or able to spend. These are not average times, so take that P/E multiple down to 10x and see what you get (clue: below where we are now), and we would already be there if not for Fed distortionary intervention. Lastly, how can there be a bubble in wisdom? How can there be a bubble in safety? With a global economic slowdown, a disinflationary to deflationary environment, and large swaths of European sovereign debt markets off limits, where does safe money have to go? Case in point is the the 30-year Treasury STRIP which outperformed all assets last year at +61%. There will be a time when American excess must be paid for and Treasuries are not attractive, but that time is not now. In terms of our recommendations for these markets, we will detail it in part III of Sleepwalking Towards a Preicipice (Part I, Part II) in coming weeks, but in short, we may “rent” equities, commodities, corporate bonds and indeed Treasury bonds (for appreciation not yield), but we don’t “own” things for long in these leaderless “accordion”-shaped markets. We ignore the myriad signals from pundits, take a top-down, theme-oriented view for alternative investments to avoid the vagaries of public markets, and we may imbibe in free drinks on make up flights for near death experiences. Who could blame us? Our latest outlook series details structural (i.e., long term) problems in the world’s largest economies that were “unmasked” by the credit crisis and Great Recession. This year’s multi-part discussion seeks to look beyond debt and deleveraging (see last year’s “The Age of Deleveraging”: Our Observations and Outlook), to assess the myriad influencers of growth, and thus market prospects going forward. Part I of our Sleepwalking Toward a Precipice series focused on structural issues in the United States. In Part II, we discuss structural problems in Europe and China, a variety of unknowns that could impact growth and markets going forward, and central bank rule. In an upcoming final installment, we discuss our investing approach given the “double-wide” possibilities for global growth and markets over the next decade. We hope you enjoy and please email or call with any questions.